When I first started writing fiction again, knowing I am faced with a new publishing landscape, I wanted to get educated on the independent-publishing world and find models to learn from. I Googled "best-selling self-published authors" and one of the first names that came up was Hugh Howey. Howey's is a top-selling, independent, Amazon-focused author; an author who bypassed traditional publishing to put his books directly online, and succeeded. He had a lot to say about the choice to self-publish and reading and listening about his experiences was a great primer on the new publishing world. But I didn't know him as an author. When I read the description of his fiction, I could see that he writes Young Adult science-fiction. I typically read police procedural, murder mystery, legal thriller, Stephen King, non-fiction related to my job; stuff like that. YA was never my thing and when I do read science fiction, I drift towards the classics (Arthur C. Clarke). So I passed on reading Howey's fiction at first. But a question kept nagging at me. A traditional publisher has an infrastructure to, supposedly, assure a level of professionalism for their products. They have a process for sorting books they think will make good products from books they think won't make good products. They have a process and personnel (editors, copy-editing, packaging, marketing, promotion, distribution) for turning those good books into publishable products. Can the product of a single author working from home, even if he or she hires a professional editor and cover designer, hold up in the marketplace defined by traditionally-published work? I enjoyed listening to Howey talk about world building and his experience self publishing but I started to feel that I needed to understand him as an author to put everything he was saying in context, to see if his product, his independently-published books, hold up to the traditionally-published standard I'm accustomed to as a reader. I downloaded the first of Howey's Molly Fyde YA series, Molly Fyde and the Parsona Rescue. Molly Fyde is a 17-year old naval cadet. Her mother died when she was young. Her father went missing, with his private space ship, seven years before. A friend of her fathers, a Navy Admiral, looks out for her. But all the other students in flight school are boys and she has a tough time. The story opens with her fighting against humankind's most vicious enemy, the Drenard, in a battle simulation. The simulator has been tampered with and she fails the test so miserably that she is kicked out of school. She doesn't fit well in regular high school and is soon is recruited by her benefactor for a mission to recover her missing father's spaceship, which has been located on a distant planet. She is partnered with her flight-school crush and things go wrong with the mission almost immediately. I won't give you much more detail than that because the story takes so many turns, I don't want to spoil the read for you but my first impressions were to confirm the young adult slant (lack of bad language, the main character's youthful pining for a strapping male peer) and there were a couple of rough language patches that needed one more edit, but it wasn't long before I was hooked into this story. 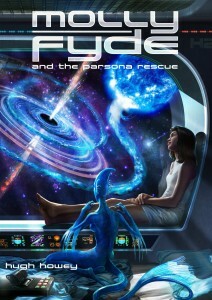 Molly Fyde and the Parsona Rescue moves quickly, like an action film. Howey leads you from scene to scene without giving away what's coming next. Then he makes what's coming next so satisfying, he effectively locks you in to having to know how the whole story turns out. He leads the reader down a path, throws up an obstacle, has the characters wrestle with the challenge, then twists and turns it in another direction altogether. Howey also does a great job with the science of his fiction. His explanations for how the Universe is populated, how hyperdrive works, how gravity affects travelers on space ships and the technology employed to protect them are all satisfying; enough science to dispel the nagging thought of how this or that is possible but not so much as to detract from the action. 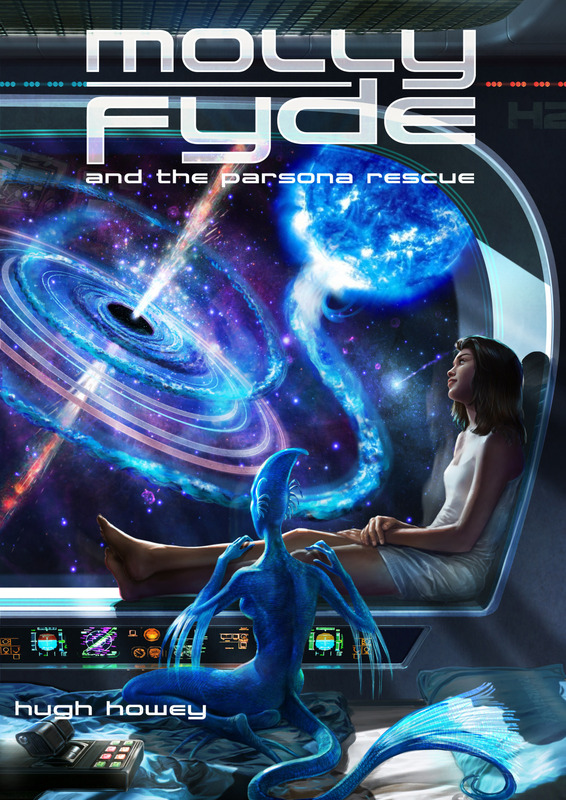 Molly Fyde and the Parsona Rescue is the first in a four-book series. The short series concpet is a repeating trend in independent author fiction. Usually, the first book in a series is a hook, sold cheap or given away and written to encourage you to invest in the rest of the series. I was worried that this conscious effort to create a series (rather than tell a story over one fully-developed novel) would feel like it was reading short fiction but Molly Fyde and the Parsona Resuce is a full-length novel. Its 400 + pages on the Kindle (I don't know what that translates into on paper, but it felt like a full-length book). It's a satisfying stand-alone story; Enough action, drama, tension, and twists to keep me going. And the hook was set; I'm part way into the second book already Moly Fyde and the Land of Light, which already feels like it was written by a more mature author - richer and more accomplished, the product of someone in command of their storytelling. Hugh Howey opened me up to reading something I wouldn't have if I hadn't been exposed to him in my search to become a published novelist. I'm glad he did because now I'm a Howey fan and I can't wait to finish the series, then put his next books my reading list. Have you read any of Hugh Howey's work? What do you think?